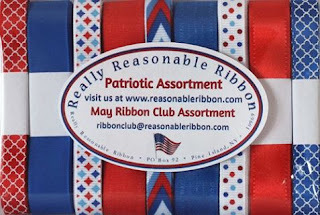 It's that wonderful time of the month for the Really Reasonable Ribbon Blog Hop, and this month our Ribbon Club Assortment is filled with trims in red, white and blue to help you celebrate the 4th of July, Summer, and being Patriotic. Just look at the gorgeous trims in this month's collection. 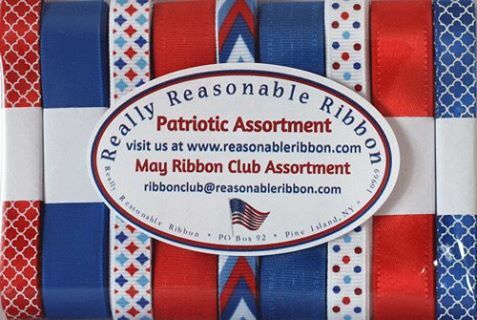 This is a great way for you to get great ribbons delivered right to your own front door every single month. You should have arrived here from Bonnie's Blog; but if you didn't, you get started here. I used all the fabulous trims in this month's collection to create my hair bows; including the 3/8" Quatrefoil Print on Poppy Red Satin, 5/8" Taffeta Electric Blue, 3/8" Patriotic Print Grosgrain Ribbon, 5/8" Poppy Red Delicate Stitch Satin, 3/8" Bold Chevron Striped Grosgrain Patriotic, 5/8" Electric Blue Delicate Stitched Satin Ribbon, 3/8" Patriotic Confetti Dots Grosgrain Ribbon, 5/8" Satin With Grosgrain Edge Poppy Red, and the 3/8" Quatrefoil Print on Electric Blue Satin Ribbon. I also used a White Plastic Headband and wrapped/covered it with White Double-Faced Satin Ribbon. Your next stop on today's Blog Hop is at the blog of my talented Design Teamie, Kathy. I know she'll have something wonderful prepared to share with you all. Don't forget to answer the question at the end of the blog, and come by to play along in our Current Challenge. 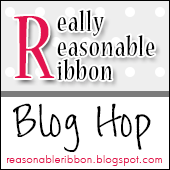 There's always lots of fun taking place at Really Reasonable Ribbon. 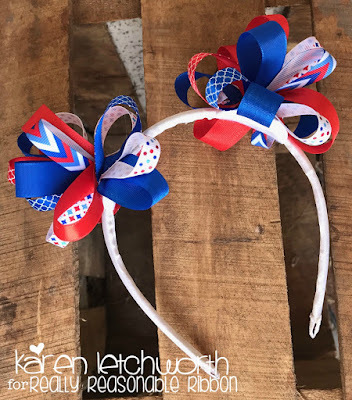 Creatalicious Challenge Blog - Challenge #114 - Anything Goes/Optional For The Girls/Mother's Day - I made a very special hair bow for a VERY special girl (my niece, Alexa). Awwww....that's adorable. I have a 2-yr-old granddaughter that'd be perfect for! Cute headband and bows Karen. Perfect for summer!! Love your hairband, with those super cute bows. Thank you so much for sharing. So very cute! I can totally picture this same project with colors for Minnie Mouse ears! Very clever! Very cute. I like how you used all of the ribbons. I can just see a little girl (or even an adult) wearing this to a picnic on Memorial Day or the 4th...so cute! This will be such fun to wear at all the summer patriotic parties. Really cute, Karen! Love this adorable headband, Karen! This is something my granddaughter would love too! What a sweet little headband, Karen. This patriotic collection is such a lovely selection. 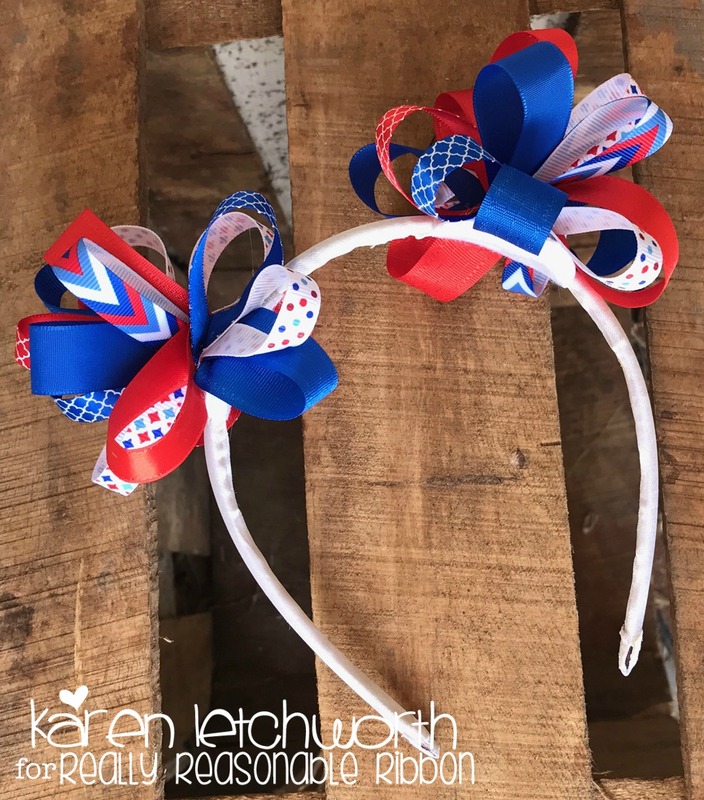 What an adorable patriotic headband! My granddaughter would LOVE it! !